Our theme for 2019 is "Making Marks." We will be using different tools to make marks on paper. Our meetings may feature a paper project and are led by a different member each month. These meetings give members an opportunity to learn a new skill or they can try out a tool they don't have. This format encourages new discoveries and shows the many and varied talents of our members. 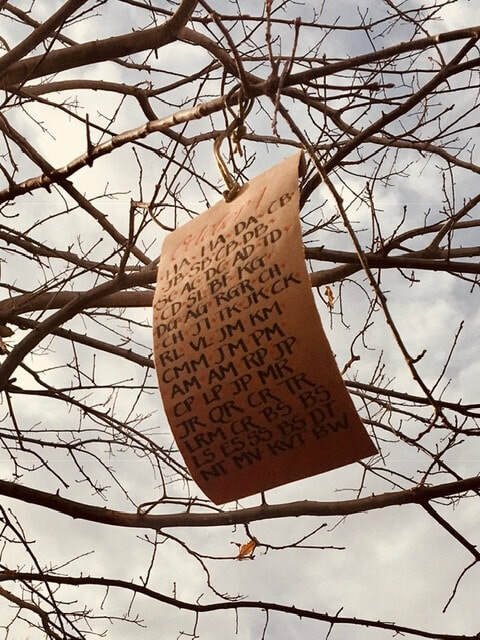 In January 2018 we made Weathergrams to hang in the Healing Garden trees. They are meant to disintegrate or blow away naturally. We wrote the names of the 58 victims from the 1 October shooting in calligraphy and some of our members hung the individual Weathergrams in their trees. It was our way to remember the people who will always be in our hearts. In 2014, The Fabulous Las Vegas Scribes adopted local nursing homes. 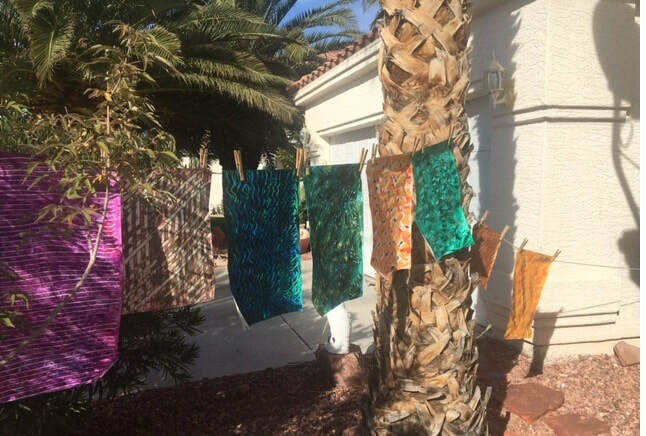 Each year members make cards with decorated papers, original artwork and/or calligraphed sayings for residents of the homes who are in need of a little cheer or who need a card to send to one of their loved ones. 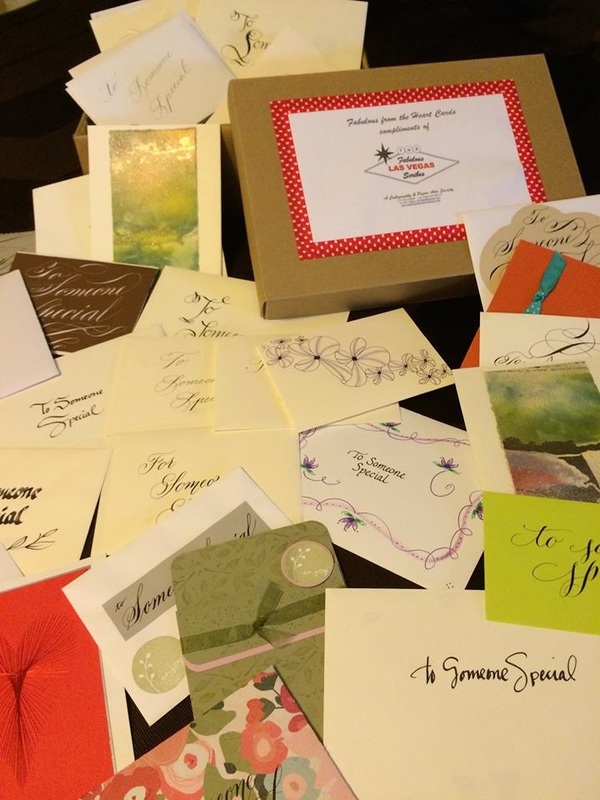 This annual project is a hit with our members, some who make the cards, others who letter them, and especially the lucky recipients of the cards. The cards we create are Fabulous! To purchase a cookbook, email us. Member recipes that they could bind. May your tastebuds be tantalized even more! All contributed by these FABULOUS folks!" If you've always wanted to make books or play with paper in an artsy way, come play with us. First-time guests are welcome to check us out for free before committing to a membership. Our members love sharing their skills and resources, you would not believe the talent we have in our group and how much fun we have every month at our meetings. There is lots of laughter, sharing and snacks to boot! If you’ve never done calligraphy and always wanted to - take our Calligraphy Basics class offered several times a year; join our Society and come to meetings. This class is offered several times a year so check out the Workshops / Classes tab for more information. If you’re an accomplished calligrapher and have been looking for a group in Las Vegas, we want you too! 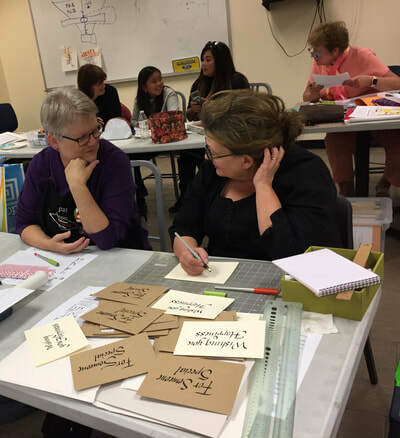 In addition to our members who do calligraphy, we also have members who make books, boxes, origami, and work with paper in other imaginative ways. We offer monthly meetings where you can work on calligraphy and a paper project (see the schedule on the left). In addition to the meetings, we participate in community events and sponsor workshops for a more intensive, hands-on learning experience. If you have a child who isn’t being taught handwriting, we can help with that too, but there are some things to be aware of - check out our Policies tab to see what we can offer. Then click on the links to the left and the ones in the Resources tab to be inspired for your next beautifully lettered project on gorgeous paper.